Anthony has always had a keen appreciation of beer, having spent a number of his formidable years in Wisconsin, Anthony learned from a young age the powers of this mysterious beverage. In 2000, Anthony moved to Columbia Missouri to pursue a beautiful young woman (who would later become his wife) and to dabble in that thing called college. Upon turning 21, Anthony discovered the 2nd best thing about Columbia Missouri, a brewpub called FlatBranch. It was there that his sojourn through the Anheuser-Busch land came to a conclusion and where his journey through craftbeer and self-discovery would begin. In 2005, after (finally) receiving his bachelor degree in Computer Science, Anthony and his wife moved to Champaign Illinois so that she could pursue a law degree and Anthony joined the workforce as a Database Developer for the University of Illinois. Anthony's interest in homebrewing developed purely by accident. He has always had an interest in cooking and one day while watching his favorite cooking show (Good Eats), he saw an episode that would change everything. It was the episode where Alton Brown brews beer (in all the wrong ways). Anthony is the perfectionist sort though, and before actually brewing any beer, he was determined to research as much as he could about it and fact check Alton Brown's process. After spending a couple of weeks researching, Anthony was convinced that this was something he could do, moreover, it was something he would enjoy. Anthony persuaded his wife that he needed a hobby while she attended law school; she agreed. By now, Anthony's obsessiveness had kicked into full gear; he had done enough research to know that he wanted to control every possible variable he could. From the onset, Anthony used yeast starters and fermented beers in a temperature controlled freezer, each fermenter heated to a specific fermentation temperature via a separate temperature controller... after a few batches of extract brewing, Anthony switched to all grain. Around this same time, he learned of various beer competitions held throughout Illinois and began sending off beers. His very first entry, a Scottish 60, won a ribbon, and this greatly encouraged him that he was on the right track. Fast forward to today, Anthony has used the hobby card with his wife to take over their garage, acquire numerous freezers and refrigerators, build a cold room, and construct an all electric brewing rig. A normal weekend for Anthony usually includes at least two brewing sessions. When he isn't brewing Anthony works as a webdesigner for the College of Engineering at the University of Illinois. 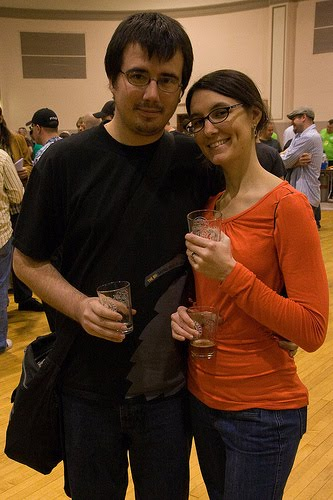 Since 2006, Anthony has been active in the local homebrewing club, the Boneyard Union of Zymurgical Zealots (BUZZ). For the past two years, Anthony has served as their president. In the near future, Anthony hopes to take his passion for beer to the next level, attending the WBA program at Siebel Institute in Chicago and brewing professionally. "One of my favorite things about brewing is handing someone the end-result and having them not only enjoy my beer, but igniting that passion and appreciation for beer that I have." When asked about the keys to his success, Anthony said, "For me the most important thing has been a very understanding and supportive wife. I am also very fortunate to have a great club supporting me. Even though we are relatively small, we have always had a great stable of BJCP judges. Finally, I don't think I'd ever had gotten as far as I have without the encouragement of all of my friends. They are always challenging me to brew more, explore new ideas, and share more beer!"